95 w w w . M o d e r n T i r e D e a l e r . c o m T P M S T P M S SUBJECT VEHICLES: Toyota Corolla 2008-2018 and Toyota Corolla iM 2008-2017 RELEARN PROCEDURE? No. SPECIAL TOOLS NEEDED? e Toyota Techstream must be used. T he tire pressure monitoring system (TPMS) of the 2008 – 2018 Toyota Corolla and 2008 – 2017 Corolla iM is designed to provide warning when the tire in€ation pressure of one or more road tires is low. 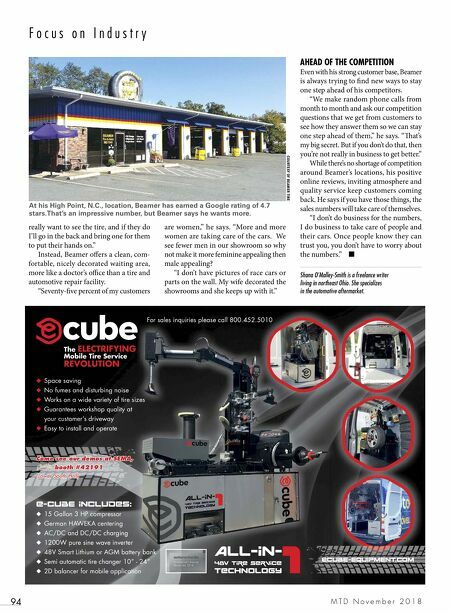 A tire pres- sure warning valve sub-assembly equipped with a tire pressure sensor/transmitter is installed in each tire and wheel assembly. e sensor measures the tire pressure. e measured value and transmitter ID are transmitted to the tire pressure monitor antenna and receiver assembly on the body via radio waves. is data is then sent to the tire pressure monitor engine control unit (ECU) from the tire pressure moni- tor receiver. If the transmitter ID has been previously registered, the ECU compares the measured air pressure value and the standard value. When the value is less than the standard value registered in the tire pressure monitor ECU, the tire pressure warning light on the instrument cluster will turn on. In order to reset the warning threshold in response to changes in tire pressure values due to tire type and installation position changes, a tire pressure warning reset switch is used. is switch is used to initialize the system aŒer certain repair procedures. Under the following conditions, the system may not function properly: • Facilities or devices that use similar radio wave frequencies are located in the vicinity of the vehicle. • A radio device of similar frequency is used near the vehicle. A large amount of snow or ice is stuck to the vehicle, especially around the wheels or wheel housings. • e ID of the tire pressure warning valve and transmitter has not been registered with the ECU. 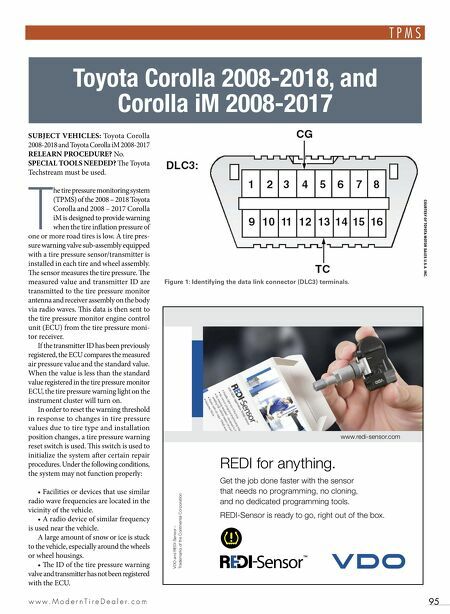 Toyota Corolla 2008-2018, and Corolla iM 2008-2017 www.redi-sensor.com VDO and REDI-Sensor – Trademarks of the Continental Corporation Get the job done faster with the sensor that needs no programming, no cloning, and no dedicated programming tools. REDI-Sensor is ready to go, right out of the box. REDI for anything. Figure 1: Identifying the data link connector (DLC3) terminals. COURTESY OF TOYOTA MOTOR SALES U.S.A. INC.